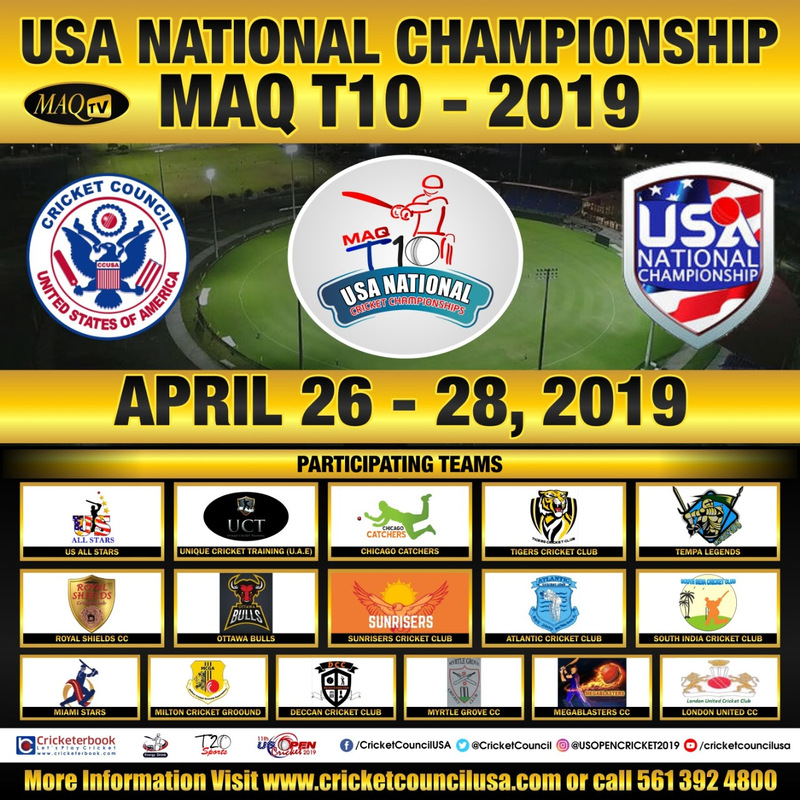 Cricket Council USA, is pleased to invite you to be a part of our USA National Championship MAQ T10 from April 26th to 28th, 2019. The tournament will be held at the ICC approved Central Broward Regional Park & Stadium, located at 3700 NW 11th Place, Lauderhill, FL 33311. We celebrate our commencement ceremony on April 26th, 2019 at 9:00 AM at the Central Broward Regional Park & Stadium, 3700 NW 11 Place, and Lauderhill, Florida 33311. We would appreciate it if you could please send us your personal statement or letter of endorsement sharing your support for the USA National Championship MAQ T10 to post in our annually Yearbook. We would also like to invite you to the Final Match and closing ceremony that will also be held on April 28th, 2019. The final match will begin at 3:00 PM with the closing ceremony following at 5:00 PM. We will also have periodic updates, including any rain delay updates, on our website.